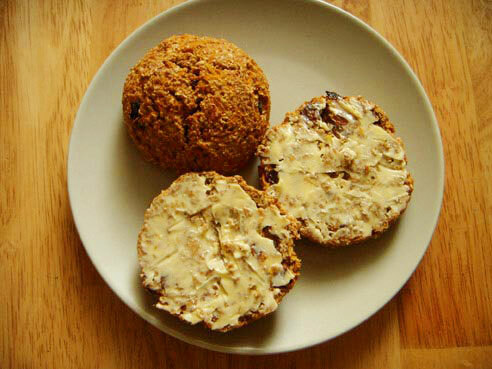 These are wholemeal raisin scones and this recipe is vegan. I used to love these – made them all the time. Unfortunately I’ve no gluten-free substitute for them but if you like raisins try the vegan soft fruit cookies – not similar really, but very good. This is an old twimii recipe that I’ve corrected – it was actually fairly correct already it said 3 mugs of wholemeal flour originally because to begin with that’s how I used to read US recipes when they said 3 cups of something I’d fill up a mug three times and use that. And you know what most of the time it worked out grand. So I started measuring out things in mugs… Anyway I don’t have many photos for these. I no longer bake them because I’m now gluten free but these were something I used to make all the time and lots of people liked them. They’re great with salty butter and a nice cup of tea. And they’re very full of fibre. Brown fruit scones – or wholemeal raisin scones if you prefer. Really good with a thick layer of salty butter and nice cup of tea. At some point I gave up yeast for a while and I was given a recipe for bread. It was pretty much the same as this. Minus the carrots and sultanas. And with wheat germ and bran added in for good measure. I decided to add in the carrots and sultanas as I wanted something a bit sweeter. I ditched the wheat germ and bran simply because it was a pain to remember to buy them. But I use stoneground wholemeal flour so I imagine there’s still a lot of nutrition and fibre left in the flour. As it is, this is suitable for vegans. The 2 dessertspoons of sunflower oil are used instead of an egg. You can add in an egg to give them a bit more of a buttery flavour. If you are vegan and/or a fan of bananas, you could have this with mashed bananas, otherwise just with salty butter is my favourite. They’re not bad with peanut butter also – but I’ve a vegan scones recipe I’ll post in a couple of weeks that’s great with peanut butter. The recipe says to dust the baking tray generously with the flour. In the Wholemeal Soda Bread recipe you can see the loaf on a dusted baking tray – you need a much more generous dusting here because the scones are a much wetter mixture. When you place them on the tray do not move them again until they are baked. Otherwise they can stick to the tray. If you wait till they are baked to move them you shouldn’t have any problems. Preheat the oven to 200° C.
Mix in the bread soda with the flour in a large bowl. Pour over the oil and mix through with your fingers till all the flour takes on a crumby like consistency. Grate the carrots finely and add to the soya milk along with the lemon juice. Stir the liquid into the floor with a wooden spoon. When the mix is thoroughly combined, add in the raisins/sultanas and stir around again. Take a baking sheet and generously dust it with flour. Take small handfuls of the mix and mould into round scone shapes and place on the baking tray (the mixture is wet so this will be messy - but worth it). The mix may be quite wet - that just means you cook it for longer. Place in the oven, on the middle shelf. Leave to bake until they cooked through - tap them on the bottom to make sure. Turn the tray around half way through - about 20 - 30 mins usually.